DOWNLOAD FORMS OR REGISTER ONLINE by June 24 to avoid late fees. Cut off is July 8. Registration deadline is June 24 – After June 24, late fees will apply. Final Registration Cut-off July 8. Online Student Registration (Submit one registration form for each student). Registration deadline is June 24 – After June 24, late fees will apply. Final Registration Cut-off July 8.Students, apply to Attend Camp for FREE! Join us this summer on the beautiful campus of Western Washington University overlooking the San Juan Islands across Bellingham Bay to the west and nestled at the foot of Mount Baker to the east. Together we’ll spend four intensive days learning and sharing information to help you develop your skills and knowledge of exemplary journalism. Whether you’re a novice student reporter, a senior editor, a veteran educator or advising for the first time, our staff and curriculum will meet your needs. Student and adviser sessions run concurrently, and in some cases sessions are combined in order to provide the best educational experience possible. Our staff members are among the finest journalism educators in the country and are specifically selected because of their knowledge, skill and passion for scholastic media. 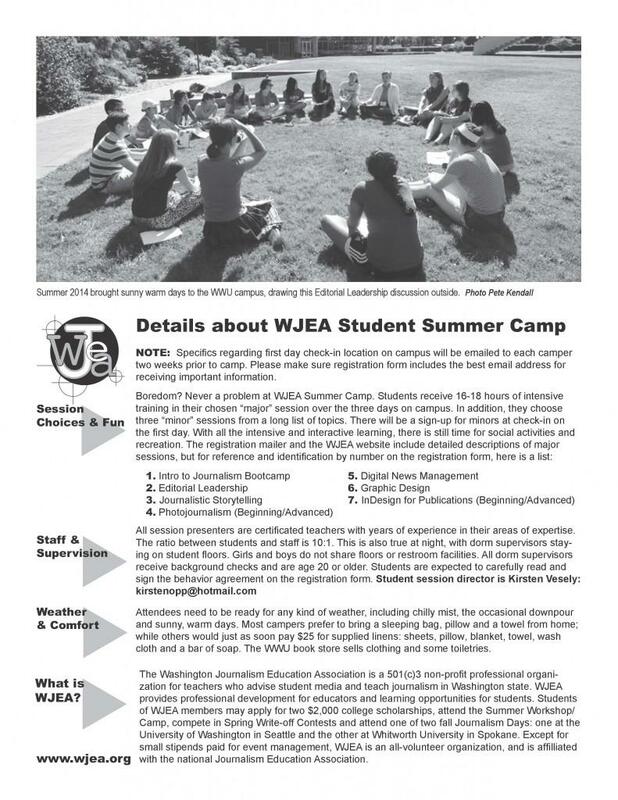 Students – Make your school media program the best it can be and make tons of new friends from around region at the WJEA Summer Journalism Workshop for students. Whether you’re an editor or a beginning staff member, you can choose a Major Session that fits your needs. Our fun, knowledgeable, high-energy workshop instructors will bring you up to date on the latest trends in writing, photography and design, plus give you plenty of hands-on experience. Besides your Major Session, you’ll attend Minor Sessions on a choice of topics. And of course there will still be time for recreation and socializing. Start the school year refreshed, recharged and refocused on improving your skills and the student media at your school. Advisers – Learn new techniques to improve your advising skills while networking with colleagues from the Northwest and around the nation. Knowledgeable workshop instructors will bring you up to date on the latest trends in writing, photography and design, plus give you hundreds of tips on curriculum, staff management, press law and assessment. Separate sessions for experienced advisers will address the specific needs of each, with large group sessions addressing current challenges facing advisers in our changing media landscape. 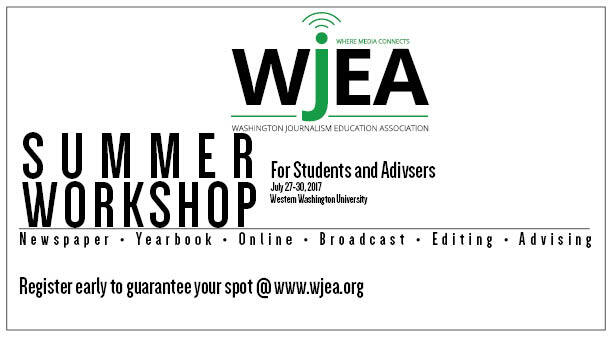 Join us and start the school year refreshed, recharged and refocused on improving journalism at your school.